Yeah, but: Perhaps they're not all the same. The Long Version: Back when I was sixteen years old, a friend of mine told me that I combine great ideas with lousy timing. Twenty years later, he's still absolutely right. 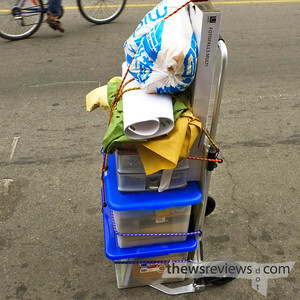 Last fall I hand-carried a forty-pound printer for a kilometer before it occurred to me that I could really use one of those folding hand trucks. Great idea, lousy timing. 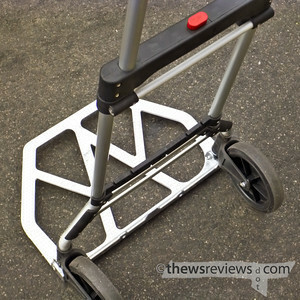 These little hand trucks are pretty much a generic product. I bought mine from Canadian Tire, but they're also available through the toy store Uline and at least a dozen other places. (1, 2, 3, 4, 5, 6, 7, 8, 9, 10, 11, 12 …) The prices and details vary, but they're typically rated for between one and two hundred pounds, and weigh about twelve to twenty. The wheels pivot out when the load platform is lowered, and while the wheels have some positive camber, the weight on the cart keeps them in place. It's an elegant little system, and when combined with the telescoping handle, the whole cart takes up very little space when it's not needed. The typical hand truck with a short bed is good for tucking under a stack of heavy boxes, and is great for running things on and off of a moving truck – quickly shuttling boxes that are already stacked. These folding trucks have much larger platforms, meaning that they're at their best when the load is assembled directly on the hand truck. That's perfect for household use, and I've seen a number of independent couriers using them when they need to zip around quickly in little runabout vans. It's a real advantage when they can carry a couple of stacks of light boxes that wouldn't stay put on the typical design. 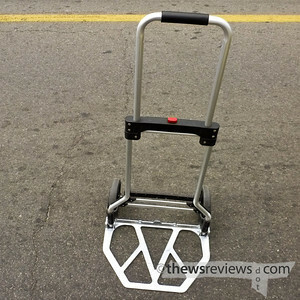 A big empty hand truck is nothing but a hassle, so it's fantastic to be able to carry this little cart folded up until I need it. I do also own one of those generic black plastic hand trucks that can be converted into a flatbed dolly, and when it's time to haul a couple hundred pounds, that's what I reach for. (Actually, it's what I dig out from the far end of the storage room.) But for a half-dozen little jobs, from shopping for a small potted Christmas tree to taking the 40lbs propane tanks to be refilled, the folding truck has been perfect. I've put a hundred and twenty pounds on mine and then walked it a city block without a single worry. And when I'm back home, it folds up and hangs on the wall where it's in easy reach for the next time. 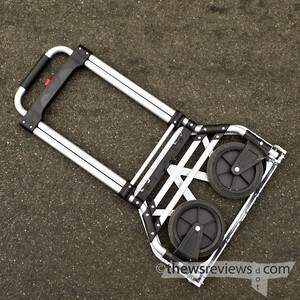 Sometimes I marvel at my little folding hand truck, and wonder what I would do without it – but the answer to that is simple. If I didn't have it, I'd go out and buy one. I play in three bands, and I have to carry about 100 lbs of gear from my car to music venues. That's why I got the Wesco Maxi Mover. Although its max capacity is far beyond what I normally use it for, I went ahead and paid extra for it anyway. I need something that not only works as advertised, but is durable enough to handle abuse or misuse. I can't talk enough about how awesome it is. Along with being able to carry up to 250 lb, and fitting neatly in the trunk of my car along with all of my music gear, it's still going strong after almost a year of steady gigging. 5 out of 5 across the board. I want to meet the guys who designed this thing.